Eating raw salmon is our family’s first choice when dining out in Japanese restaurants. We'll make sure they are really fresh and clean of course. 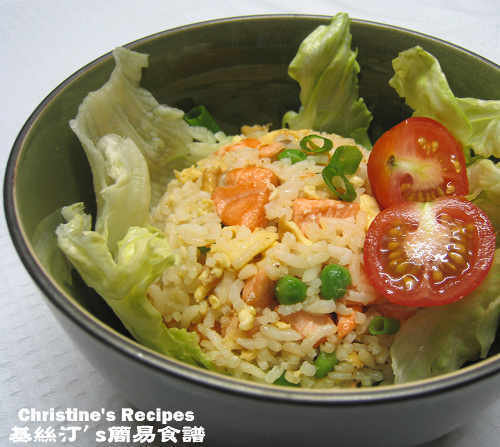 Well, this salmon fried rice would be the second one then. With this rice, I can easily feed my family on a small budget. I also tried this dish at home, pretty easy and quick. Best of all, I made this quite-good-looking bowl of fried rice by using the leftovers in my fridge, feeling to have an achievement of being a housewife. Heehee..
Rinse salmon and wipe dry. Cut into small pieces. Set aside. Blanch baby peas in boiling water for 2 to 3 minutes. Drain well. Heat oil in a frying pan, add whisked eggs to fry until half cooked through. 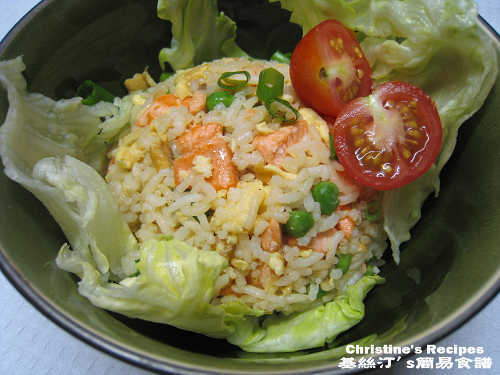 Toss rice in the frying pan and stir fry with the egg quickly until the rice is heated evenly. 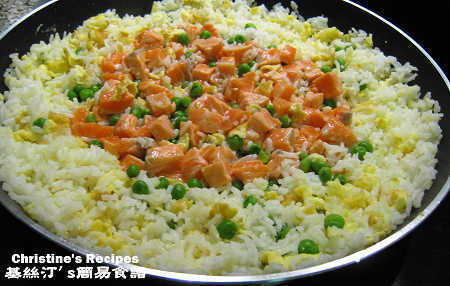 Push rice to sides of frying pan, Add salmon and peas in the middle, and stir fry for 3-5 minutes until salmon is cooked. 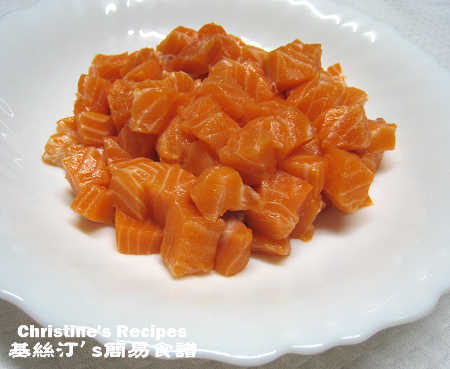 It doesn’t need too long as the salmon is quite easily cooked through and the peas has been cooked. Sprinkle with soy sauce, sugar, black pepper. Add salt to your taste. Stir fry for another minute or two. Done. Serve Hot. You might like to heat up the leftover rice in a microwave oven to shorten cooking time. I’ve shared some tips on how to fry yummy rice in a previous post. Feel free to take a look. I tried this recipe, and love it. Thank you very much for sharing this. This recipe is very forgiving. You can use any favourite vegetables as well.